• For quantitative determination of ADP determination in cells and other biological samples. • Adenosine diphosphate (ADP) is the product of ATP dephosphorylation by ATPases. ADP can be converted back to ATP by ATP synthases. ADP levels regulate several enzymes involved in intermediary metabolism. 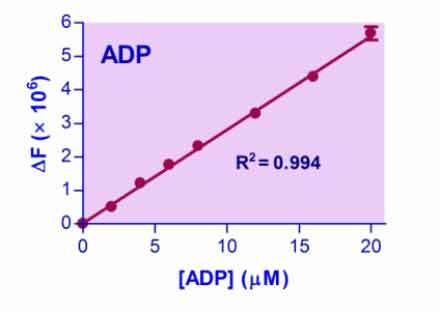 Conventionally, ADP levels are measured by luciferase/luciferin mediated assays after ADP is converted to ATP. However, since these assays require measurement of ATP in the sample before conversion of ADP to ATP, if the nascent ATP concentration is significantly higher than the ADP concentration, the ATP signal will drown out the ADP signal. BioAssay Systems? newly designed ADP Assay Kit provides a convenient fluorometric means to measure ADP level even in the presence of ATP. In the assay, ADP is converted to ATP and pyruvate. The generated pyruvate is then quantified by a fluorimetric method (lexc/em = 530/590nm). The assay is simple, sensitive, stable, high-throughput adaptable and can detect as low as 0.1 µM ADP in biological samples.